Team weBloc brought good news! If you saw the related news stories, you might have noticed a little bit. 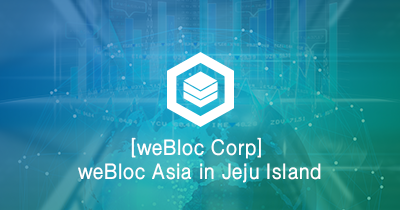 Team weBloc is preparing to establish a corporation at Jeju Island in Korea. weBloc, aims to create a transparent and fair digital advertising ecosystem based on the blockchain, is making effort to contribute to the development of the country through the establishment of a domestic corporation as weBloc does its business in Korea. Furthermore, based on its business capabilities in Kora, Jeju Island will be a good bridgehead for planning to advance into Asia, including Vietnam, Indonesia and Thailand. Jeju Governor Won Hee-ryong also agreed to help the blockchain business grow within legal limits. Jun Hong, CEO of weBloc, said “Now that Korea is attracting attention as the leading country in the blockchain in the world, we think it is important to make good opportunities in a timely manner” and is taking the process carefully. Team weBloc will walk one step right.